If one is in the right frame of mind, Who Slew Auntie Roo? can be a lot of ghoulish fun. It's not good, mind you; as a matter of fact, Roo is basically trash. But it's campy and silly and just the ticket if you're in the mood for a film that makes you groan at its inanity as often as it makes you shiver. The basic premise is a good one for a slasher film, taking the Hansel and Gretel story and resetting it in a somewhat more contemporary milieu. Unfortunately, the screenplay doesn't really take advantage of the premise to come up with more than a handful of imaginative twists. It's also poorly structured in places, with characters who are introduced and seem as if they will play an important role, but then just fade away. However, Curtis Harrington's creepy, engagingly manipulative direction helps to make up for these deficiencies, as does Shelley Winters' deliciously overripe performance. Chloe Franks is also good, but Mark Lester is unfortunately wan and rather clueless. Ralph Richardson, Hugh Griffith, and Lionel Jeffries also add to the fun, even if they're under-utilized. 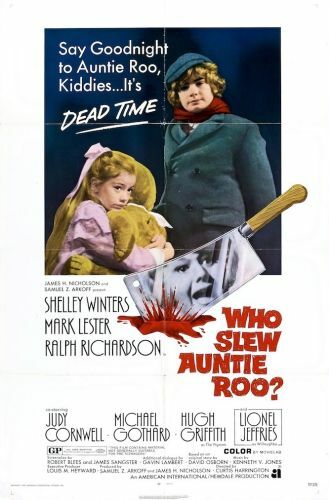 Some will never enjoy Who Slew Auntie Roo?, and that's understandable, but others, when in the right mood, will get a kick out of it.